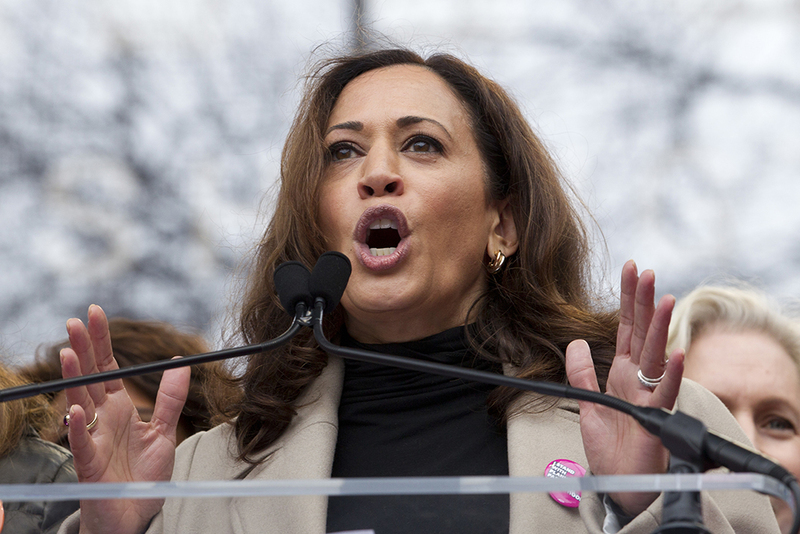 Sen. Kamala Harris (D-CA) speaks during the Women's March on Washington, January 21, 2017. In order for women to achieve political parity, the whole system that chooses and supports candidates has to change. The 2016 elections were a historic disappointment for advocates of women’s political parity in the United States. Not only did the first female major party candidate for the White House fail to win the highest office in the land, but around the nation, political representation by women continued its now nearly two-decades-long stall as well. As Hillary Clinton’s decisive, nearly 3-million-vote win of the U.S. popular vote indicates, Americans do see women as viable political leaders. This willingness to vote for women, however, is not translating into steadily increasing numbers of women in political office. To figure out why—and then prevent this disconnect from continuing—it’s time to move on from old analyses that focus uniquely on voter bias and look instead at what’s preventing voters from having the chance to express their support for women candidates in the first place. Doing so requires a detailed look at the structural impediments to women’s political participation—the whole constellation of forces having to do with recruitment, fundraising, and the support of political power brokers, or so-called gatekeepers—that keep women off ballots and out of office. Correcting the problem will require a set of concrete and structural solutions to open up the political universe to the most diverse range of newcomers, including women of all races and socio-economic backgrounds. Shifting the public conversation on women’s political progress from a discussion of attitudes—among voters, the media, and the so-called ambition gap among potential women candidates themselves—to the structural factors that block women’s progress will require a major change, not just in tactics but also in mentalities. Americans tend to view running for office through an up-by-the-bootstraps, “Mr. Smith Goes to Washington” storyline and to downplay the structural factors that have historically expanded the choices and enhanced the political opportunities of some at the expense of others. The belief that the political path is equally open to all people with enough gumption to follow it, however, is naive. In the long term, real structural factors have created a permanent political class of white, male—and in recent decades, increasingly wealthy—Mr. Smiths. For our political leaders to be so unrepresentative of modern-day America is toxic for our democracy. It reinforces the now-pervasive belief that our government is divorced from and unresponsive to the concerns of everyday people. And as we have recently seen, this belief reinforces the sort of political nihilism that allows destructive extremism to grow. Women make up just more than half of the U.S. population.20 They account for 47 percent of the U.S. labor force21 and 49 percent of the college-educated workforce,22 while at the same time they perform the lion’s share of caregiving for children and other relatives.23 This means that their grounding in the day-to-day challenges that most Americans face could not be more complete—and that the need for their leadership could not be more pressing. In the latter decades of the 20th century, it seemed that as women moved up in the professions, and as public attitudes toward women’s responsibilities and capabilities gradually improved, political parity would follow. Unfortunately, this has not been the case. Voter sexism, and outright misogyny, do, of course, still exist; the 2016 presidential election provided countless examples, generated by both candidates and voters. And while data on how women fare as candidates for state-level executive office are very limited, one 2015 study36 conducted for the Barbara Lee Family Foundation by Kelly Dittmar, a scholar at the Center for American Women and Politics, did yield some troubling results. Dittmar studied the nine gubernatorial campaigns in 2014 in which women were on the ballot—looking at press coverage, polls, debates, social media, and campaign output—and interviewed candidates and members of their campaign staffs. She found, consistent with previous research, that women candidates had to prove their qualifications for executive office while also meeting voters’ higher “likeability” demands upon them as candidates. What this appears to mean is that in order to win, women campaigning for executive office must perform gender in just the right way to hit the sweet spot in voter attitudes—conforming to positive stereotypes while countering negative ones. Academic researchers such as Burrell, Dittmar, Hayes, and Lawless do not argue that all sexism is gone from the American political scene. On the contrary, experimental studies conducted in laboratory settings, in which subjects are tested on their views of hypothetical male and female candidates, still show the presence of some forms of classic gender bias. But what the new research shows is that, when people are called upon to make voting decisions in real-life settings, those abstract beliefs about men and women don’t have much meaning. What really matters, in our increasingly divided times, is a candidate’s party and ideology. Indeed, from 1980 to 2012, women made up only 13 percent of all candidates in primaries for U.S. Congress.43 In light of this, their 19 percent current representation in Congress could be seen as an outsized success. How are we to square the new research that tells us that women campaigning for public office are treated and thought of as well as men with the fact that women’s political representation is still so woefully inadequate? A big part of the answer lies in understanding that there’s an essential caveat to many of the studies that show men and women doing equally well as candidates. Those studies are designed to isolate the effect of gender by comparing men’s and women’s chances at winning legislative office, all else being equal—that is, after factoring out real-life differences so that you can compare “apples to apples” such as incumbents to incumbents. The problem is that the real-life trajectories of male and female candidates is rarely an apples-to-apples proposition. Take the issue of incumbency, which gives officeholders an enormous advantage at election time. Men were 81 percent of the incumbent members of the U.S. House of Representatives in 2016. Incumbents ran in 90 percent of House races that year. And 97 percent of those incumbents won their races.44 The same general pattern holds at every level of elected office in the United States. This political establishment—call it a system of gatekeepers—determines who is recruited and encouraged to run for office, who gets fundraising resources, and who wins endorsements—in other words, who gets on the ballot and in which races. Campaigning while female—always a complicated game—takes on a whole new level of complexity once race is factored into the equation; the standards of viability are even higher, appearance is all the more scrutinized, and “relatability” is tougher to achieve. For Nina Turner, the former Ohio Senate minority whip, all this added up to major problems in convincing donors of her viability when she ran for the office of Ohio secretary of state in 2014, aiming to become the first African American from the Democratic Party to win a statewide office in Ohio.48 Although Turner had a considerable public profile, was a media favorite, and had the statewide backing of unions and other grassroots organizations, her opponent, the Republican incumbent Jon Husted, out-fundraised her nearly three-to-one. In an interview with the author, she attributed her fundraising difficulties in part to the fact that donors typically calibrate how much money they will give a candidate to how they judge the candidate’s ability to fundraise, holding off on giving their maximum support until a candidate has hit a fundraising threshold. All people—men and women alike—are more likely to run for office if asked. Yet as women are less likely than men to think they are qualified to run for office,50 they especially need to be asked, often repeatedly. And they are less likely to get that encouragement.51 None of the women interviewed for this paper reported having been actively recruited by the powers that be. “Oh Lord, no. Not in the slightest,” said Teresa Purcell, who managed Sen. Murray’s first, long-shot race for the U.S Senate in 1992, when asked if party gatekeepers had sought Murray out and supported her early on in that campaign. A 2014 report from the Institute for Women’s Policy Research reached similar conclusions. After conducting 60 interviews with female candidates, officeholders, and congressional staff members, the researchers found that 51 percent of the female candidates and elected officials said they had never been encouraged by party leaders to run for higher office, and 71 percent said they had never had such encouragement from other power brokers. In fact, a number of women interviewed for this report spoke of subtle dissuasion: for example, party officials telling women not to mount primary challenges to incumbents in their own party. And even when they were given the nod to run, women were often encouraged to compete in difficult races where their own party was more likely to lose. In some states, the problem of low pay is mitigated by the fact that legislative office is considered a part-time job. But that is of little help for those whose jobs don’t permit them much flexibility or who have caretaking responsibilities that make commuting to a statehouse far from home all but impossible. This again keeps candidates without personal wealth, support on the homefront, or career flexibility—disproportionately women—from running in state-level elections and eventually finding their place in the pipeline for higher office. With training and support from Emerge America, Annissa Essaibi George, a public high school teacher and yarn store owner, first ran for the Boston City Council in 2013—and in 2015 she won an at-large seat, dislodging one of the council’s longest-serving members, 18-year veteran Stephen J. Murphy. In doing so, she became the first Arab American to serve on Boston’s traditionally white, male council. Having an alternative gatekeeper structure behind her was key. The winner-take-all systems that govern how most elections work in the United States give enormous power to incumbents, who are primarily white men. Many of those advocating for a government that is more representative of American voters now argue that to open up more space for women and people of color, we need to change those winner-take-all systems in ways that create more opportunities for outsiders. In November, voters in Maine narrowly approved a ballot measure making it the first state to adopt ranked-choice voting to elect its U.S. senators and members of the House of Representatives, as well as future governors and state legislators.62 The 2018 election will be the first using the new system. There is, however, a significant caveat concerning the efficacy of both of the above measures: Studies seeking to measure the representation of women overall have shown them to yield positive results, but when results are broken down by race, there are indications that they do not help the chances of women of color. A 2006 study by Becki Scola, a political scientist at Saint Joseph’s University, analyzed the relationship among a number of state demographic, ideological, and structural factors and women’s legislative representation. The study concluded that the factors that predict the presence or absence of women of color in state legislatures are not the same as those that predict the representation of white women or of women overall. In particular, Scola found that a state’s use of multimember legislative districts did not lead to a greater political presence for women of color.67 A 2008 study by Jessica Trounstine and Melody Valdini—political scientists at the University of California, Merced, and Portland State University, respectively—looked at city council races in more than 7,000 cities and showed that the use of ward- or district-based systems instead of at-large systems helped black men and white women win elections, but had no effect for African American women and Latinas.68 The reason for these discrepancies was not clear in the studies and will require further research. There are a number of concrete actions that can and should be taken to address the structural impediments to women’s leadership in U.S. politics. Our political parties need to fundamentally re-examine how they identify, recruit, and back candidates and put into place systems that hold party powers that be accountable for change. To get up to speed, the parties should set voluntary numerical goals for the recruitment of female candidates for primary elections in any given year. To identify top-notch potential female candidates, party officials at both the national and state levels should work with groups that recruit and train women to run for office and make a long-term investment in grooming talented women who can ultimately emerge as leaders. These groups, in turn, must make determined good faith efforts to find a diverse pool of women and tailor their recruitment and training programs in ways that address the distinct needs of women of color, who face an additional set of challenges in breaking through gatekeeper barriers and acquiring the sort of social capital that leads to both name recognition and the ability to fundraise on a large scale. The notion of setting voluntary numerical goals for recruitment implies a far more flexible practice than the gender quotas now used internally by the Democratic and Republican parties. (The membership of the Republican National Committee includes one man and one woman from every state and territory, and the Democratic Party’s convention delegates are split evenly between men and women.69) It would be relatively easy to build on the parties’ stated desire for gender equity through nonbinding candidate recruitment goals. It would be advisable as well for the parties to make concerted efforts to ensure much greater gender diversity in their leadership structures. Once women are established candidates running in congressional-level races, they have the ability to fundraise as well as men. Yet a relative lack of personal wealth and lack of connections to donors with deep pockets pose a serious problem for would-be female candidates looking to get started in politics. Women tend to be less well-off than men and are less likely than men to have the networks to generate large donations. This means that women are less likely to get the attention of gatekeepers and, by extension, less likely to get the funds they need to run successful campaigns. If gatekeepers with financial power want to put their money where their mouth is on increasing the presence of women in office, they need to earmark more of their resources for women. Deep-pocketed individual donors, leadership PACs, and PACs in general should set voluntary numerical goals for the number of women they will support in each campaign cycle and prioritize funding women who run in open-seat races. Currently, only 12 states pay their legislators a salary that is at least as high as the state’s median household income.84 The low pay—and in some cases, no pay—provided by many state legislatures to their members means that only people who are able to forgo considerable time and income can afford to be on the ballot. This excludes anyone without a highly flexible schedule, considerable support at home, and significant personal wealth. Therefore, states should increase pay for legislators so that potential candidates with breadwinning responsibilities can devote themselves to public service. The private sector has long known that workplace practices that help employees integrate their professional and personal responsibilities are key to recruiting and retaining talented women. Our legislative bodies need to catch up to this awareness and adopt practices aimed at easing the logistical hurdles faced by lawmakers with caretaking responsibilities, as well as those who live far from state capitals. This means that state legislatures must adopt scheduling practices that limit early morning meetings and evening floor debates and votes, as well as allow telecommuting—and proxy voting—when feasible. The underrepresentation of women in U.S. politics does serious damage to the legitimacy of our democratic institutions. If significant numbers of Americans believe that our government is best described as an “old boys’ club,” as a plurality of likely 2016 voters polled by the Women Donors Network’s Reflective Democracy Campaign in 2014 asserted,86 then they clearly do not feel it is responsive to their needs. And as the anger and resentment expressed in the 2016 presidential election cycle showed, this feeling of alienation from government can lead to extremely destructive outcomes. The lack of women in U.S. politics can no longer be blamed primarily on voter sexism, nor should it be blamed on a simplistic idea of a so-called female ambition gap. Political ambition does not exist in a vacuum; it stems from a sense of what’s possible. That’s why any discussion of political parity that focuses on women’s internal processes regarding the decision to run without taking into account the external forces weighing upon that decision will necessarily miss the mark. A truly meaningful approach to increasing women’s representation must acknowledge that despite vast improvements in voter attitudes toward female leaders, men and women still encounter a very uneven playing field when they run for office. Moreover, the structural impediments that mark that field have very deep roots and represent a wide array of entrenched interests. Decades of focus on voter bias and women’s states of mind have not proven terribly effective in increasing women’s political representation in the United States. But international examples of rapid change via quotas87 and, increasingly, examples of successful, homegrown campaign finance and election system reform clearly indicate that structural solutions do work. Moving forward, the United States needs high-quality research to track the effects of measures such as small-donor public financing, voluntary recruitment and funding goals, and election system reform on increasing the representation of women in office, with special attention to the political fortunes of women of color. Judith Warner is a Senior Fellow at the Center for American Progress. She is also a contributing writer for The New York Times Magazine and the author of a number of best-selling books, including Perfect Madness: Motherhood in the Age of Anxiety. I am extremely grateful to all my colleagues at the Center for American Progress who generously gave their time and thought to this report. I am particularly indebted to the Art and Editorial team and to Kaitlin Holmes and Danielle Corley for fact-checking, and I am thankful to have had input from Carmel Martin, Michele Jawando, Liz Kennedy, Jocelyn Frye, and Shilpa Phadke. I owe an extra debt of gratitude to the many women cited in this paper who made time in their busy schedules to speak with me, and was very fortunate throughout to have been able to consult with Brenda Choresi Carter, Andrea Dew Steele, Kate Black, and Cynthia Terrell.